Safe Ride for Kids® introduces the Tummy Shield® as an alternative to the seat belt which wraps around a mothers growing pregnant abdomen. It's super comfortable and gives us a peace of mind. Safe Ride for Kids® is a safety first company designed to make pregnancy, infancy and the toddler years safer and more comfortable for parents and children. With a large line of travel vests and shields, Safe Ride for Kids® offers alternatives to pregnant mothers faced with the uncomfortable ride most vehicles offer. Safe Ride for Kids® has recently introduced the Tummy Shield®. This revolutionary new design redirects the seatbelt down and out of the way of the growing abdomen all the while protecting the mother and child like never before. Greg Durocher demonstrates in the latest video produced by Safe Ride for Kids® how simply and yet sturdy and effective the Tummy Shield® is. As a paramedic and firefighter, Durocher spent 18 years studying and learning the effects of car crashes on pregnancy and pregnant mothers. Durocher urges all mothers to consider the shield and a preventative method to help avoid injuries to the mother and child in the event of a vehicular accident. "The Tummy Shield® prevents the injuries that we were so concerned about and this simple yet sturdy product is a must-have for all mothers and if my wife were pregnant there is no question that we would have one of these in the car," says Durocher. The Tummy Shield® is a steel plate and steel hook wrapped in a protective soft cover. The safety strap is anchored to the plate and wraps under the seat to prevent contact with the legs. The seatbelt is then redirected down between the legs and hooks under the hook to prevent contact with the abdomen. 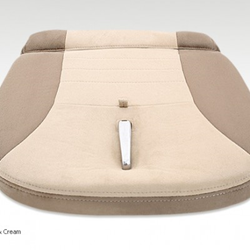 Recent reviews state, "I've been using the Tummy Shield® for two weeks and love it. It's very comfortable in both our [cars]. My husband and I often swap cars and swap driving and have found it easy to install and reinstall on the driver seat or front passenger seat of either car."